The Beatles' second appearance on The Ed Sullivan Show was to take place at their Miami Hotel, the Deauville, on 16 February. Ahead of it they undertook a series of rehearsals. 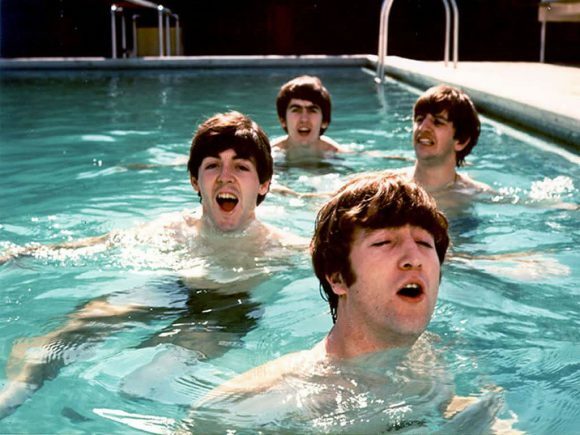 In addition to today's brief rehearsal the group took part in a photo session for Life magazine in the swimming pool at the home of a Capitol Records executive. We'd told Brian we wanted a pool, and a guy from a record company had one. Looking back, it was quite a modest little pool for Miami. Not a huge affair. We would go round there in the afternoon and not get bothered. It was great – four Liverpool lads, you know: 'Get your cozzies on.' Life magazine was taking photos of us swimming. They also took a tour around Miami Harbor in a boat lent to them by Bernard Castro, the inventor of the sofa bed. Two reporters had attempted to stow away on board but were safely dropped off on the shore. Afterwards The Beatles' bodyguard, Sgt Buddy Bresner, took the group home to meet his family, who gave them a meal. People were lending us yachts, anything we wanted. There were two great things in Florida. One: I was taken to my first drive-in in a Lincoln Continental by two very nice young ladies. Two: a family lent us their boat and let me drive. It was a sixty-foot speedboat, which I proceeded to bring into port head-on, not really knowing much about driving speedboats. They have those pretty rails on the front, and I bent the bugger all over the place. But they didn't seem to mind, you know; they were just happy! In the evening they stayed at the hotel, enjoying the entertainment at the hotel's nightclubs. They watched comedians Don Rickles and Myron Cohen and singer Carol Lawrence. Even The Beatles weren't exempt from Rickles' act. We were all on one table with our policeman buddy, our chaperone – we had this one bodyguard who came everywhere with us; he was a good mate and we often went back to his house – and he started on him: 'Hey, cop, get a job! What's this? Looking after The Beatles? Great job you got, man, looking after The Beatles!' He went on, 'It's great. They just lie up there on the ninth floor, in between satin sheets and every time they hear the girls screaming they go "Oooohh".' Very funny, we thought. We were not amused, as I recall. Very cutting. I like him now but at first he was a bit of a shock.